We all know the role of captains in the Indian Premier League is a very important role to play. That's why we have seen a lot of changes happening in the captaincy of the IPL from time to time. We may see a different captain for the same team in IPL 2019. 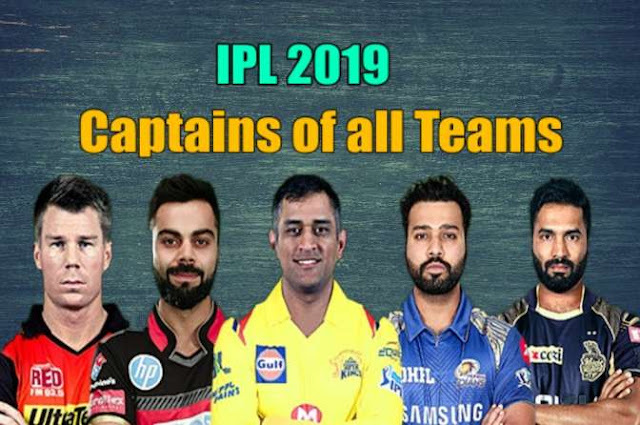 Today I will tell you all the names of the captains of all teams in IPL 2019. So Scroll below for the complete IPL 2019 Captains List. Here is the list of captains of all teams which will be playing in IPL 2019. Some teams did not make it clear that who will be captain in IPL 2019 but for them, I have predicted the most probable and suitable captain in IPL 2019. Fist take a look on the Captain of the team Mumbai Indians, it's none other than Rohit Sharma. Rohit has always been consistent in the IPL right from the first season. He Might not be on the top 5 list every season but he does a decent job in the IPL. He is a very talented and experienced cricketer who has learned a lot from Dhoni like Ekalavya. As a captain, he was always spot on. Playing under MSD would have an impact on his thinking as well and Ricky Ponting being the coach for MI for last 2 season Rohit is one of the luckiest people to work with two of the most successful captains. He has also got a really smart mentor and support team comprising of Kumble, and Jayawardena (previously punter). Their invaluable experience Surely helped him helped a lot. So Rohit Sharma is best suitable IPL 2019 captain for Mumbai Indians and surely he will be the captain of MI. Steve Smith is making a comeback in international cricket as well as IPL after being banned for two years for ball tampering scandal. He might be undergoing a lot of emotions at that time. It won’t benefit Rajasthan to put the pressure of captaincy on him. So, he should be made to play as a player only, for the next season. Cricket Australia has already said it clearly that Australian players are playing in ODI World Cup 2019 won’t be available for the entire season of IPL 2019. Seeing the current form of Australia’s ODI Squad, it is clear that they are missing the services of Steve Smith badly. So, there are possibilities that he will need to leave IPL within the middle of the season. Before IPL 2019, Royal Challengers Bangalore (RCB) franchise is making few shocking changes. They have already appointed Gary Kirsten as their coach replacing Daniel Vettori and have also appointed Ashish Nehra in the coaching staff for bowling coach. In the Auction of IPL 2019, Royal Challengers Bangalore did some surprising bidding after buying Shivam Dubey. Now talking about the captaincy of Royal Challengers Bangalore (RCB), there were some rumors going on that Virat Kohli will not be leading RCB in IPL 2019, Kohli is dropping from the captainship of RCB and appointing AB de Villiers as the IPL 2019 captain of RCB. But finally, it's cleared that Virat Kohli will be the captain of Royal Challengers Bangalore in IPL 2019. And I think Kohli is a good captain. He has been leading India for a long time and always keeping the team as well as himself on top. So Virat Kohli will be the captain of RCB in IPL 2019. Now if we Talk about the captain of Chennai Super Kings in IPL 2019 then we will find only one name - Mahendra Singh Dhoni. No doubt he is the best captain in the world. Dhoni has already won the trophy three times in Indian Premier League and there is no doubt in IPL 2019 also that he will be the captain of Chennai Super Kings (CSK). This one bewildered me up completely and believe me I took an hour figuring out which player is more appropriate. Both of these players are really great with good skills and have lots of experience. My preference is Kane Williamson because Warner would have just returned from the ban after a long time and Kane has done well captaining NZ against PAK pretty well, so my opinion is Kane. Delhi Capitals which used to be known as Delhi Daredevils for the previous seasons. Delhi Capitals had two captains in the last season, for the starting matches they had Gambhir as a captain and later Shreyas Iyer became the Captain of Delhi Daredevils. Now they have traded Shikhar Dhawan from Sunrisers Hyderabad so they have two options for captain in IPL 2019. But I think they will prefer Shreyas Iyer as a captain in IPL 2019. Now if we talk about Kolkata Knight Riders, the last season was not good for Kolkata Knight Riders and Dinesh Karthik was leading the team that means The captain of KKR in IPL 2018 was Dinesh Karthik and he was unable to show the spark like Gautam Gambhir's captaincy. But looking at the team after Auctions, I think KKR don't have many options for captain in IPL 2019. So Dinesh Karthik will be the Captain of KKr in IPL 2019. At last, we are going to take a look on Kings XI Punjab. As we have seen in the previous season of Kings XI Punjab, Ravichandran Ashwin was the captain of KXIP but he was unable to show that sharpness in his captaincy. He was unable to full fill expectations as a captain. So they must be thinking about Changing the captain in IPL 2019. KXIP has a lot of options available as captains. Maybe we will see KL Rahul as a captain of Kings XI Punjab in IPL 2019. So that was the list of all 8 teams and their IPL 2019 Captains List. So friends what is your opinion on the captaincy of your favorite team? Write down below.